Chichico is thrilled when a talent scout spots him during a kick-about with his friends Davi and Ana, and he is asked to try out for Santos Brazil. 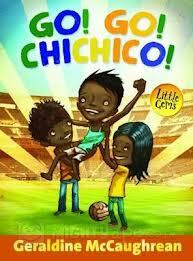 But without a pair of football boots, will Chichico ever be taken seriously? He needs a little help from his friends! Fun story for 5-8s from the award-winning Geraldine McCaughrean.